this 60 day devotional is for the woman who lets her emotions control her. it gently guides you on how to make your emotions work for you rather than against you. it's so easy to come unglued when others irritate, disappoint, criticize or do other things that bump into our happy. each day starts with scripture, a thought for the day, a 2 - 4 page devotional and ends with a prayer. this devotional is to accompany the unglued book lysa wrote. i haven't read that book yet but am really thinking i should. from reading the devotional, i'm thinking it can stand alone on it's own and wouldn't think it necessary to read the book first. 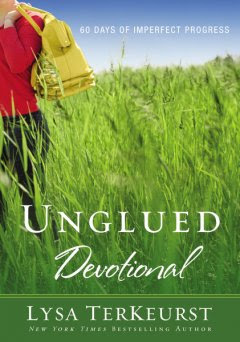 i really enjoyed this devotional. the lessons were short, easy to read and easy to understand. i was easily able to relate it to my life. lysa is honest and speaks from experience, not candy coating her own trials or poor choices she made in allowing her emotions to control her. lysa offers Biblical advice on dealing with naughty littles, trusting in God when we are fearful, being wronged by friends, disappointment, abrasive people, conflict and aching hearts. there were so very many days that i could relate with every single word she was saying. i am sure one mama that needs to learn how to control her emotions.